Home Costs > How Much Does a Water Meter Cost? How Much Does a Water Meter Cost? A water meter, whether your government is requiring you to upgrade or you need one for the first time, may come at an expense. The primary purpose, as you may or may not know, is designed to measure the flow of the water flowing into your home, allowing the utility company to see how much water your household uses monthly. How much does a water meter installation cost? The cost of installing a water meter will depend on your geographical location, the type of install, the size of the meter and who’s performing the install. The costs, either billed to the government or consumer, can range anywhere from as little as $400 to replace an existing water meter to as much as $3,500+ if it needed to be connected to a service line and the pavement needed to be replaced. These are the prices for both the meter and professional labor. If you’re replacing the water meter on your own and the utility company allows you to do it, then the costs, from what we researched will be in the $150 to $250 price range for the meter only or closer to $500 if it’s a digital meter. This won’t include the professional labor rates and will be the cost for just the water meter. If your utility company recommends a particular model, they may provide it at no charge. Since all jobs are so unique, consider using HomeAdvisor.com to receive multiple free quotes from licensed contractors in your area. 5/8 inch - $400 if replacing existing meter on an existing line. - $2,500 if replacing meter and a new connection needs to be made. 3/4 inch - $400 if replacing existing meter on an existing line. 1 inch - $450 if replacing existing meter on an existing line. - $2,700 if replacing meter and a new connection needs to be made. 1-1/2 inch - $650 if replacing existing meter on an existing line. - $3,000 if replacing meter and a new connection needs to be made. 2 inch - $800 if replacing existing meter on an existing line. - $3,500 if replacing meter and a new connection needs to be made. Tucson, Arizona, for example, performed a study, showing us a new water meter could cost when installed. A developer installed water meter box on an existing line, for instance, could cost $393 for a 5/8-inch meter to as much as $775 for a two-inch meter. A new meter installation that needed to be connected to a service line could cost $2,333 for a 5/8-inch meter to as much as $3,444 for a two-inch meter. Angel Fire, a village in New Mexico, lists its official prices for installing a new water meter on its official website. The prices range from as little as $1,551 for a 5/8-inch sealed register to as much as $12,305 for a compound meter. The charges include the labor time, equipment time, the cost of the meter and related costs. According to this Bloomberg BNA article, the average cost to install a smart meter on every house in Washington D.C. is $180, according to DC Water, which distributes drinking water and collects and treats wastewater for more than 672,000 residents in the D.C. area. GovTech.com noted that, in California, a smart meter would cost $312 per household. In most cases, you will need a permit before you can tap into the city’s water line and/or to dig a supply line in order to connect to the water main. While some contractors may tie these permit fees into their estimates, some won’t. Always check with the utility company first before replacing or installing a water meter, because most of the time, the meter needs to be located near a water line entry point and an in “official” location in most cases. Most municipalities won’t allow you to install your own meter and will either require you hire an approved contractor or use the utility company. Before you call, however, they will ask your plumbing is ready to go when they show up on site. 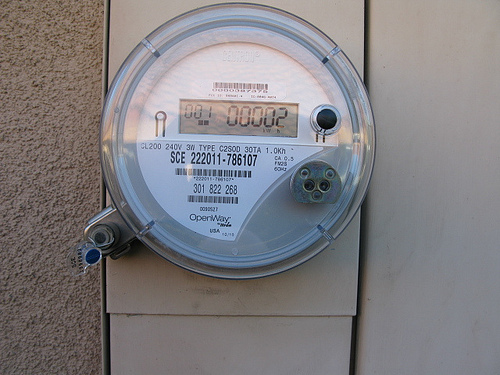 A water meter can either be purchased online, if your utility company allows you to do it, or via the utility company.